When I got home from birding Jamaica Bay this morning I was greeted by an odd email off the ebirdsNYC listserv. A rail, unidentified to species, but with a link to pictures taken by the finder, had been found in a vacant lot on the east side of Manhattan. It was a Virginia Rail! In Manhattan! So of course I went off to see it (it’s a good thing Daisy was studying)! Two trains and walk across the east side later I was on the scene. The bird was relatively easy to find, only about six inches from the sidewalk but behind a seven-foot high chain-link fence. Unfortunately, I could see that one eye was shut and the bird did not open that eye at all. That, coupled with the fact that Virginia Rails don’t normally stand still when one is less than a foot away made me think that the bird was injured, probably from flying into a building. What else could I do but call around to the birders I know and try to track down a wildlife rehabilitator? I managed to get a name but not a phone number so I called 411 and got the number. After a kind of convoluted conversation (my cell phone’s 518 area code had her convinced I was in Albany) the federally-permitted wildlife rehabber agreed to come down to the site and see what was up. In the meantime, a couple of other birders arrived and enjoyed the same close-up views that I did. Upon the rehabber’s (she would like to remain anonymous) arrival she agreed that the bird should be captured, which, considering it was behind that aforementioned fence, was not going to be easy. She briefly trained me in the art of netting a wild bird and getting it out of the net into a bag. So I climbed the fence some distance from the bird (on its blind side) with a paper grocery bag tucked into my jeans and once I got over the fence the rehabber passed over the net, which resembled a butterfly net. The most difficult part ended up being handing the paper bag with the rail in it over the fence without tipping it over or letting the rail out of the bag. We managed though, and I didn’t even rip my pants climbing back over the fence. Once I was back over we all walked to a bench where the rehabber took the bird out of the bag and gave it a quick examination, which revealed the right eye was severely swollen with blood visible behind the eye, and some feathers were missing from where the bill meets the forehead, which is probably where the bird hit a building. Next up was applying a saline solution to the eyes and forehead to clean them, which she did quickly and carefully. After that there wasn’t much to do besides head home, but not before we heard some cool stories about other Virginia Rails that the rehabber had rescued (apparently they turn up in New York City more than one might think). This post has been submitted to Bird Photography Weekly #6. Go check it out! Great work Corey. I love hearing about people who go to great lengths to save tiny creatures. Cool story Corey. Sounds like it is (and was) in good hands. Good on ya. 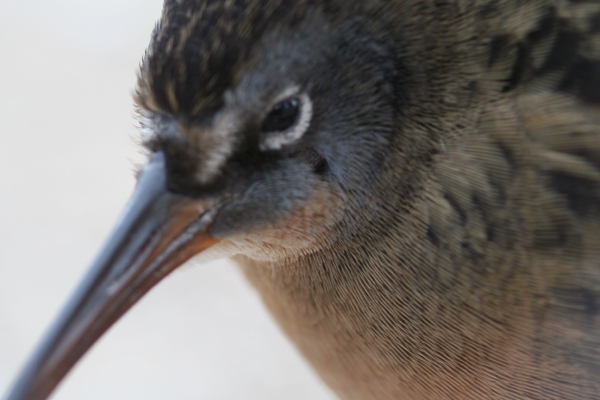 (Stop me if you’ve heard this one, but…) My life Virginia Rail was kind enough to land on my street in Brooklyn where I could stumble across it on the way home from a bar-hop. I think it was just as confused as I was, but it seemed pretty lively – rather than hitting a building, I suspect it took the rain-slicked street for a creek and decided to put down voluntarily. That’s quite a find. I’m glad you were able to get the bird safely to a rehabber. That should increase its chances for survival. The only Sora I have ever seen was a corpse by the side of Sunset Blvd down here, so rails don’t just get into predicaments in NYC. A couple of years ago, birders in South St. Louis found a Virginia Rail in an alley in a residential area. The bird appeared unhurt and was gone the next day. @Carrie, John and Jack: The rehabber said that rails are often victims of window/building strikes, and that it is not at all uncommon to see one running around downtown Manhattan after such an incident. @Wren: Whoo-hoo, I am a hero! Good rescue, and let hope more people will this kind work. Hi Corey This mike from Vancouver WA. I just found a Virgina Rail at work next to the building. His left eye badly injured and not moving at all. I’m thinking he probably hit the building. So i walked right up and picked him up, and put him in a box and took him home. I found a rehab center and hopefully they take him in when they open. He looks just like yours. I took lots of pics and he’s doing a lot better. He’s drinking water, but is still not afraid of me. I hear Virgina Rails can run like hell. Well i have him in rehab tomorrow, just thought i share my similar story. @Mike: Thanks for sharing – and I’m glad you did the right thing and got the bird to a rehabber.